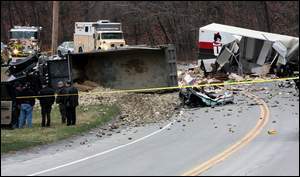 FISHKILL - A person driving an Utz snack foods box truck was killed in a collision with a large dump truck hauling stone on Route 9 Wednesday afternoon. Town of Fishkill police, who were in charge of the accident scene, did not release any names, pending notification of the family. Initially, it seems the Utz truck was traveling north, and the dump truck, from West Hook Sand & Gravel, was heading south, on the way to deliver stone to Long Island. The two vehicles collided near Interstate 84, about a quarter mile north of the Putnam County border, Miller said. Route 9 was closed from the time emergency officials arrived on the scene around 2 p.m., and reopened about 8:15 p.m., Miller said. The state Department of Transportation was on the scene to clean up the gravel spill.